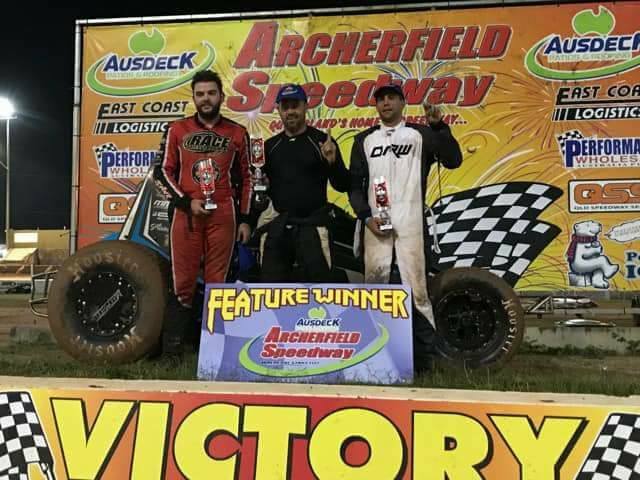 It was Queenslander Glenn Wright who came away with the victory in last Saturday night’s Ian Boettcher Race Parts Wingless Sprint 50 Lapper at Brisbane’s Archerfield Speedway, wrestling the honours back from the hands of the visiting NSW drivers who had prevailed over the last two seasons. 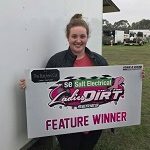 Despite only making a handful of appearances this season due to concentrating on racing in Speedcar and Compact Speedcar classes, Wright proved that his time out of the driver seat of his Wingless Sprint certainly hasn’t affected him, with the Ipswich-based racer collecting a hard-fought win that earned him $400. While it was Wright who ultimately came away with the 50 Lapper spoils, it was defending champion Harley Smee (NSW) who secured the pole position start for the feature race, after a pleasing performance throughout his heat races. Taking the early lead, Smee was only able to enjoy his position out in front for the opening five laps, before Brant Chandler relegated him to second, with Wright in hot pursuit quickly pipping him and bumping him back to third. Chandler’s stint in first place was also brief, as Wright pulled off a passing move to power into the lead, introducing what would go on to be a fierce battle throughout the remainder of the duration. Controlling the pace for over 20 laps, Wright looked likely to remain in his position; however, not willing to let Wright pull away, Chandler sat close to his tail, before executing a pass on lap 31 to reclaim the lead. With the 50-lap feature race amazingly going 43 laps non-stop, Chandler’s pathway to the chequered flag looked clear, until the race’s only stoppage, caused by Geoff Davey losing a wheel, forced the field to bunch back up and therefore opened the door for Wright once again. The final seven laps were anything but boring, as Chandler and Wright continued to trade the lead back and forth. While it appeared that Chandler had done enough to hold off Wright, a last-lap lunge from Wright proved to be fruitful, with the latter going on to claim a very narrow victory from Chandler, who was forced to settle for second place. After withstanding challenges from Paul Robinson and Cody O’Connell throughout the feature race, Smee did well to hold on for a third-place finish, with youngster O’Connell and Robinson coming home fourth and fifth respectively. The top-10 finishers were John Slack (NSW), Natasha Herne (NSW), Michael Butcher (NSW), Joshua Dreaver and Mick Reid (NSW). Steve Thomsen, Corey O’Toole and Matthew Wright (NSW) completed the final finishers. Following a heat-race win, it was a disappointing end to the night for Brody Thomsen, who retired to the infield just four laps into the feature race after starting out of position two, later being joined by Brad Keiler, Davey and Ryan Harris. Earlier in the night, the heat-race wins were shared between Smee, Slack, Butcher and Brody Thomsen. 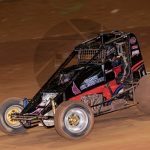 Wingless Sprints Queensland would like to thank Ian Boettcher Race Parts for their valued support of the 50 Lapper.